What? A city spa based within a bright and buzzy bath and body store, always using the brand’s very own deliciously scented, fresh and handmade products. We visited the Chelsea branch on London’s fashionable King’s Road to re-connect with our long lost love for the brand. A perfumed air of sweet scents waft outside to the pedestrian’s pavement, luring you right in to this beauty apothecary filled with lotions and potions that are almost good enough to eat. The delightfully delectable display of colourful fizzy bath bombs, luxury bath melts, massage bars and smelly soaps stacked like cheese, all dazzle and delight the senses as you enter. We couldn’t help but feel like big kids in a candy shop. At the spa itself, inspiration has come from influences as diverse as birdsong, traditional English music, the scent of an English country garden, and a calming cup of tea in a cosy cottage kitchen. Focusing on all the senses, Lush Spa tries to work not only on your body and soul with its treatments but also on the subconscious. The spa also has its own range of music, which includes spoken words to tap into your inner state of being. Dressed with a flair of shabby chic meets country living, the treatment rooms are spacious, inviting and you even get given a bell to ring when your ready for your therapist to get to work their magic on you. Best For: Those who feel more intimidated by bigger spa chains and hotel spas will like the homely, laid back and friendly feel. It’s also fantastic for seasoned spa goers who are looking for a unique ritual experience unlike no other. Perfect for healthistas and believers in all things natural, as well as those with children. Treatments We Love: The ‘Validation Facial’ receives the full validation from us. After working out the two buzzwords you want your skin to feel like and your mood to be at the end (I said ‘hydrated’ and ‘plumped’ and ‘happy’ and ‘relaxed’), you are shown around the store by your therapist, who educates you on each of the products that will be used during your prescriptive treatment, scraping some of each on to a circulate slate plate. As you head back to the beauty couch, a bubbling potion of dry ice with mixed fruit water detonated with boiling water signifies the start of the ritual (this becomes carbonated and is added to freshly squeezed orange juice to make for a refreshing drink to finish with later). Highlights included Lush’s ‘Ultrabland’ (named this because it’s fragrance free) was used to cleanse my skin before ‘Full Of Grace’, a melty solid serum bar made of Portobello mushrooms and Amazonian butters was liberally massaged all over using ice cold stones and gentle, sweeping strokes. The company’s global bestseller, ‘Angels On Bare Skin,’ a fresh facial cleanser and scrub made of lavender, rose absolute and chamomile blue oil gave me a glowing polish. After a mask was applied and rubbed off using warm towels, the ‘Gorgeous’ facial moisturiser was delicately applied over the face. Made of freshly juiced fruits with cold-pressed and organic oils for brightened, revived skin, apparently this lotion was made especially for Princess Diana. We also love ‘The Good Hour,’ a deep tissue, full body massage that helps to get to the root of your tension evil. Using unique muscle release techniques inspired by tribal witch doctors, it is also choreographed to rugged sea shanties, helping you to feel as if you are escaping from the shackles of life. Jelly discs made of eucalyptus, spearmint and peppermint essential oils help to cool and alternate the body’s temperature to help stretch muscles and elongate the spine. 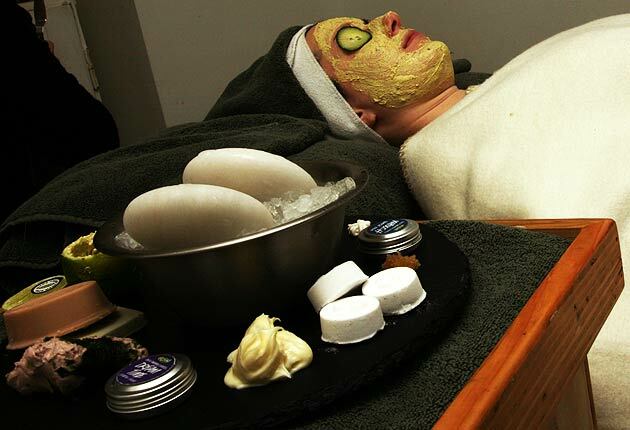 Have a go at the Lush Spa and you’ll be left yearning for more.